Just when you think that the credibility of the mass media can't get any lower (see Major Media Reports 60-year-old Eighth-hand Rumor as Proof of a Crashed UFO. ), they fall for this one. According to a new book by Annie Jacobsen, "Area 51: An Uncensored History of America's Top Secret Military Base," what crashed at Roswell was not an alien saucer, but instead a collaboration between Stalin and ex-Nazi Mengele to cause panic in the U.S. This absurd claim was presented in all seriousness by many of the major media, including the Huffington Post. The Albuquerque Journal (May 22) headlined, "Stalin, Nazi Implicated in Roswell Incident." The story was also reported in the Boston Globe, AP News, etc. Practically the only news outlet to show any proper skepticism was Bloomberg's review of the book, "Roswell Martians Might Have Been Nazi Kids From Mengele’s Lab." Second, how did this thing fly? Its propulsion system would be immediately recognized by U.S. experts as conventional and terrestrial. Its electronics would also be immediately recognized as Soviet in origin, years behind the best U.S. made systems. The idea that Stalin could fool U.S. experts into thinking that they were examining an extraterrestrial craft is simply absurd. Stalin was indeed devious and evil, but he was not stupid. Third, the children who had allegedly been deformed by the cruel Dr. Mengele to look like extraterrestrials reportedly did not all die in the crash. Surely their Soviet handlers knew that if any of them survived, they would immediately be screaming for help in Russian or German, and would reveal the deception at once. Fourth, this is an attempt to explain something that does not need explaining. 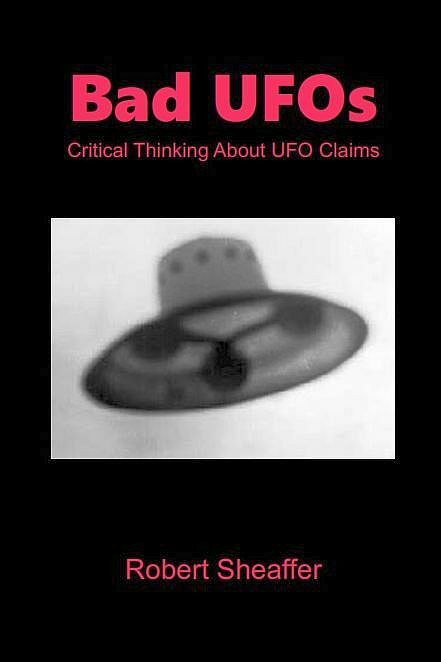 Jacobsen's wild claim attempts to explain the origin of a disc-shaped craft that allegedly crashed at Roswell, containing alien-looking beings. But there is no credible evidence whatsoever that this is what was actually found there. The man who actually found the Roswell debris, Mac Brazel, described it as looking like "large number of pieces of paper covered with a foil-like substance and pieced together with small sticks much like a kite." In other words, like the debris of a balloon's radar reflector, probably from Project Mogul (see my book UFO Sightings, chapter 4). There is no credible evidence that what was recovered at Roswell was ever anything bigger than tinfoil and sticks. It is not wise to invoke extraordinary explanations for ordinary phenomena. This is the Fallacy of Misplaced Rationalism, when the "rational" explanation is even more implausible that what it is supposed to explain (see my "Psychic Vibrations" column in the Skeptical Inquirer, July/August, 2008. Reprinted in Science Under Siege, Kendrick Frazier, ed.). Fifth, as anyone who has read Solzhenitsyn's Gulag Archipelago surely realizes, Stalin never gave anyone who might have some information embarrassing to the Soviet state a chance to tell it. For example, millions of returning Soviet prisoners-of-war were sent to the Gulag for the "crime" of having first-hand knowledge of the outside world. We know that Mengele was hiding out in Bavaria under an assumed name from 1945 to 1949, and escaped to Argentina soon afterward - all while Stalin was still living. Thus the known facts of Mengele's life contradict this preposterous tale - at no time was he ever living in the USSR, or even in the USSR-occupied sector of Germany. If Stalin ever held Mengele, he would have placed him in the Gulag, probably in the "First Circle" (see Solzhenitsyn), where scientific and technical prisoners were held, but compelled to work for the Soviet state. Stalin never would have let him escape, and Stalin lived until 1953, by which time Mengele had been in Argentina for several years. But when did the major media ever let common sense get in the way of a sensational story? As you might have heard, approximately 150 members of a Taiwanese UFO cult called Chen Tao (“Perfect Way”) came to the U.S. in 1996 expecting to meet God, who they said would arrive in a flying saucer. They first settled in San Dimas, California, a state where cults seem almost normal. Then suddenly they moved to Garland, Texas, the sort of town where a large crowd of foreign-speaking cult weirdos would not exactly pass unnoticed. A group of homeowners in Garland wrote the mayor and City Council complaining that this bizarre group was ruining their neighborhood. The mayor replied that these people were simply exercising their rights to free speech, and there wasn’t anything he could do. However, what he should have replied was, “Don’t worry, these people won’t bother you for long. They say they’re going to be carried away on flying saucers on the morning of March 31.” For according to the group’s leader Hon-Ming Chen, God was going to arrive at his house on that date at 10:00 AM Central Time with a whole fleet of flying saucers, swooping all of them up from the earth to rescue them from the coming Great Tribulation. Authorities, suspecting that the saucer fleet might not materialize, feared another mass-suicide like the Heavens Gate UFO cult last year, especially since many members carried neatly-packed backpacks with identical white clothing and sneakers for their anticipated heavenly rendezvous. The Taiwanese media had been reporting that Chen was encouraging newcomers to kill themselves so their bodies could be picked up by flying saucers. However, the church members denied having any thoughts of suicide. Large numbers of reporters, in addition to Chen’s followers, gathered at the appointed place and time but, alas, nothing happened. Chen had an explanation: God had already arrived, invisibly, and entered their souls. As soon as things quieted down a bit, Chen announced that God would not be gathering people up from Texas after all, but instead from the area of the Great Lakes. He and a small group of the faithful set off for Buffalo, New York. Many of the others returned to Taiwan. While in New York, Chen had a vision of the numbers seventeen and eighteen, which he interpreted as a divine instruction to move his followers to the town of Olcott, where those two numbered road routes intersect. Should anyone care about Chen’s remaining prognostications, he sees Armageddon occurring in August of 1999. Of course, with the year 2000 fast approaching, if the Apocalypse does begin, the doomsayers will be lined up for blocks trying to get credit for the prediction. (For more information on the Chen Tao cult, see http://www.anthroufo.info/un-chen.html). I should note that I'm currently working on a book of my Psychic Vibrations columns. Rob Pudim has kindly agreed to let me use his cartoons from the Skeptical Inquirer - and there are a lot of them! I expect to have the book electronically published, and it should be available on Amazon.com and elsewhere by the end of the year, if not sooner. I'll keep you posted. Also, I am this week's guest on CFI's Point of Inquiry Podcast, hosted by Karen Stolznow (http://www.pointofinquiry.org/robert_sheaffer_its_a_conspiracy/ ). Have a listen! 1994 was a great year for the world ending. Indeed, the world ended more times in 1994 than in any other year in recent memory. Harold Camping, president and general manager of a 39-station network of religious radio broadcasters, proclaimed that before the end of September, 1994, the dead would be arising from their graves for their final judgment. Camping explained to the San Jose Mercury News (Sept. 4, 1994) that he had arrived at his prediction by a laborious and careful process of counting off significant dates in the Bible. Furthermore, his math has been checked by a nuclear physicist and “a number of scientists at the Lawrence Livermore lab,” as if errors in arithmetic were the only way such a prediction might go awry. Mainstream religious scholars, of course, suggested Camping was seriously mistaken. Fortunately, Camping exhorted his listeners, “Don't do anything bizarre. Just live the way you should have been living all the time.” His stations are still on the air, and seem to have found something else to talk about. June 9, 1994 was another date on which the world ended. 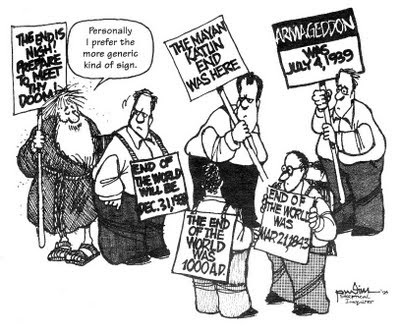 Various fundamentalist prognosticators somehow settled upon that date, and started warning ominously that “June ninth is coming,” the day on which God would supposedly “rip sin out of the world.” Warnings were issued for a major destructive earthquake somewhere along the Pacific “ring of fire,” supposedly only the first event in an eschatological progression. 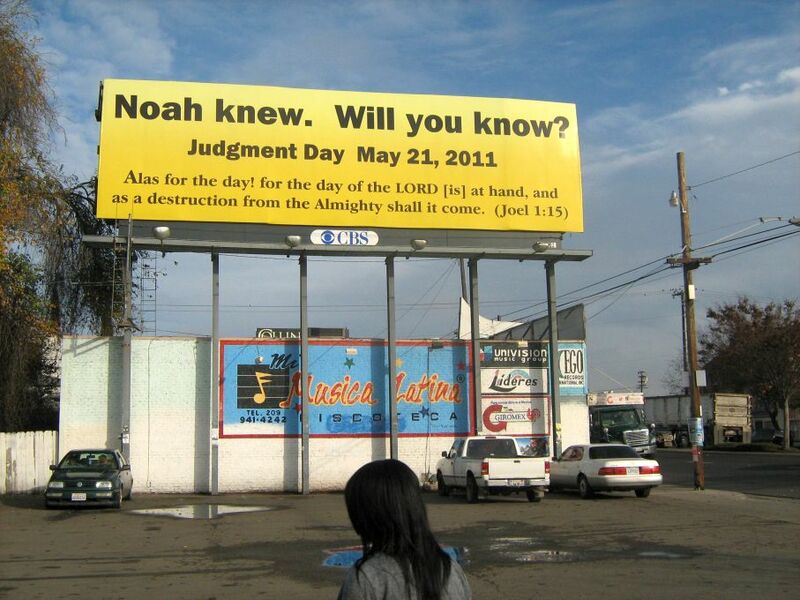 So widespread was the expectation that it was even mentioned on the 700 Club [evangelist Pat Robertson’s popular TV program], although with the clear disclaimer that it would not be the start of the Rapture. When a large underground earthquake, which caused little or no damage or casualties, struck on this date, it was hailed as fulfillment of the prophecy. The last we checked, the world still had plenty of sin. But don't give up on the eschaton merely because the world has survived into 1995. Dr. Leland Jensen of Missoula, Montana says that he is the Second Coming, and that during 1995 the earth will suffer great meteor impacts, earthquakes, and major planetary changes. Those lucky enough to survive all this will enjoy Heaven on Earth. And according to a story in the Washington Post (March 12, 1994), followers of the Institute of Divine Metaphysical Research expect the world to end in an instant, by 1996. So the end may come while you are reading this page. Fortunately, even if these people are right, they won't be in a position to gloat about it!